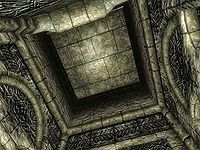 Like the dungeons in Cyrodiil and Oblivion, the Shivering Isles are littered with traps. Although a few traps are familiar from the vanilla game (see notes), the dangers found in dungeons on the Isles are generally unique in appearance or function. Description: Two varieties exist; you will see a small slab sticking out of a wall or pillar carved with either a red laughing face or a green angry face. Effect: Activating the button will activate the object it is connected to. Notes: Buttons can activate a wide array of objects, including traps. Buttons will often only open a gate, but can sometimes trigger a trap instead. If the button next to a gate triggers a trap, you will have to look elsewhere for a mechanism to open the gate. Always be careful when pushing a button and look around first to see if there are signs of traps or other buttons. Physical traps usually damage their victims and push them backwards. The damage cannot be avoided by magical means; the only way to reduce damage from these traps is the Resist Normal Weapons effect. The damage dealt by physical traps is leveled, and is calculated for each actor individually by using its own level. The amount of damage dealt is not affected by the difficulty slider. As with trigger traps, physical traps can be used to a player's advantage to kill groups of enemies. Description: Cave ins may appear as rocks falling from the ceiling or as a free-standing column that crumbles. There are no visible traits to distinguish either variety. Effect: When the player enters a certain trigger zone, rocks will fall down and deal damage to any actor they hit. The damage is typically (3 to 5) + 0.75 × level damage, but several ceiling cave ins will deal 8 + 1 × level damage. Notes: The rocks will only fall once, but will remain on the ground and can still cause damage if moved too quickly by grabbing or area of effect spells. Although it is impossible to actually recognize a column or ceiling that is about to cave in, there is a pattern in their placement. For example, when you see several columns in a row, there is a good chance that one will crumble (but usually not more than one per row). Some ruins may have no cave in traps at all, while some others are full with them. If you encounter one cave in, there is a good chance there are more in the area. Xeddefen is notable as the ruin with the most cave in traps. 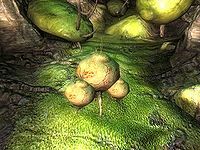 Description: Look on the ground for a plant similar in appearance to root stalks, only smaller and surrounded by a cluster of circular growths with red markings. Holes can be found on the walls next to this plant. Effect: When the player steps on the plant, spikes will shoot out of the wall. Every actor hit by spikes will receive 5 + 1 × level damage. The area targeted by the spikes is a narrow area perpendicular to the tunnel. Either avoid the trigger to avoid the trap, or move quickly over it. Description: Look for small, slightly bent pipes sticking out of the wall. Effect: When an actor comes too close, the root will grow very quickly, damaging anything it touches. Every actor hit by the root will receive 5 + 1 × level damage. This trap will not physically move you, and can actually swiftly kill actors who wander into this trap by repeatedly damaging them. 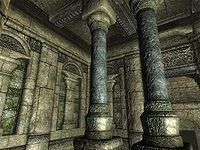 Description: The secret wall looks similar to normal walls, but a few traits may betray it: the wall has no decorations, and there may be a small stair leading up to it. Effect: When you pass nearby, the wall opens. 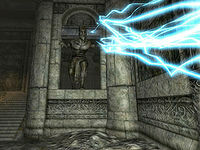 Notes: An enemy can usually be found behind a secret wall, and will immediately attack when the wall opens. Some walls may not reveal an enemy, but instead hide treasure or even passages to other areas. 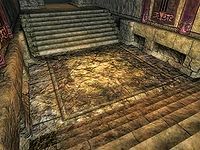 Description: The trapped floor looks similar to normal floor tiles, but never has any static objects placed on it. Looking at the dungeon map may reveal a passage running underneath the passage. A trapped floor over a lower passage is likely. Effect: When you come near the edge of the floor tile, the floor will open. The trap may also be activated by a button. Any actor who falls into the trap will receive standard falling damage. Sometimes spikes may be found under the trapped floor. In Ebrocca, some floors open and close after set time intervals. Some remote areas can only be reached by purposely falling through one of these traps. 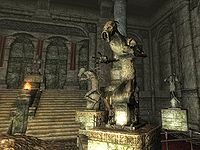 Description: These large statues in the shape of a Hunger are generally indistinguishable from a normal statue. Effect: When the trap is triggered (by entering a trapped zone or pushing a button), the statue will fire a Damage Health or Shock Damage projectile aimed at you or at a particular spot. Notes: This trap will always remain active and cannot be disabled. 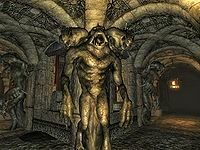 [verification needed] Statues found outside are never traps. There are two main varieties of this trap: a normal version and a weaker version (with a reduced Damage Health effect). The weaker version is usually found in groups, and their combined effect is actually more dangerous than the standalone version. Effects for the weaker version of this trap are indicated by the levels shown in parentheses on the table. A third, much less common variety employs an area Shock Damage spell with slightly lower stats than the standard Damage Health effect. This variety is found in only three places: two fallen hunger statues in Xeddefen, Felles and Xeddefen, Fales and a Sheogorath statue in Ebrocca, Masse. The spell effect can be absorbed and resisted, but it cannot be reflected. Description: This large statue of a Scalon is generally indistinguishable from a normal statue. Effect: When the trap is triggered (by entering a trapped zone or pushing a button), the statue will fire a Damage Health projectile at you or at a certain spot. Notes: This trap will always remain active and cannot be disabled. [verification needed] Statues found outside are never traps. Description: Look on the ground for a balloon-shaped plant with little spikes on top. They can usually be found close to a wall. 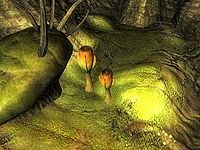 Effect: When the player comes too close to the spore pod, or if it is attacked with an arrow or a spell, it will cast an area of effect spell. The traps casts Drain Agility, Fortify Speed, and Paralyze on everyone in a certain area (see table for magnitude). If you set off the trap by firing an arrow or spell at it, the trap may be used to hurt other actors. After the trap has been set off, it takes 15 seconds to recharge. The spell effects can be absorbed and resisted, but not reflected. 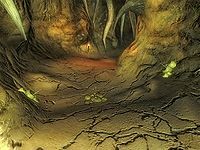 Dart traps and spike pits that appear in Oblivion are also used in Shivering Isles. Darts are found in Aichan, Cylarne, Cann, Ebrocca, and Xaselm. Spike pits are found in Ebrocca and Milchar. This page was last modified on 23 October 2014, at 23:15.